Whew, I just barely got in my hour today. With us having church on Sunday, it tends to be a crazy day, and in the past I don’t think I’ve ever gotten my KCW hour in. But I was determined to do it this spring because I had one more outfit I wanted to get done! 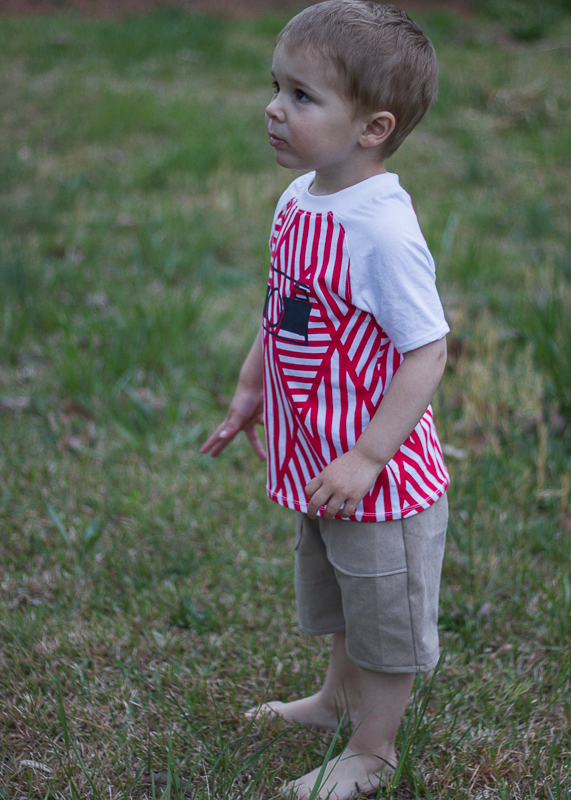 In taking the photo shoots this past week, I realized that Oliver needed a pair of plain khaki shorts that would match with all his colorful tees. I got this finished right as the sun was going down, and we ran outside to snap a few pics before we lost all our light. The shirt is one of my faves from this week. (do I say that about every one? lol) I got the abstract geo print from the Fabric Fairy using a gift card (incidentally at the same time I got the stripes for this tee). The fabric is a cotton lycra blend and I really like the weight and feel of it. I have been collecting different types of knits over the last few months and getting a feel for the type I like and the type I am not as fond of (basically not a fan of poly blends even if they are cute). 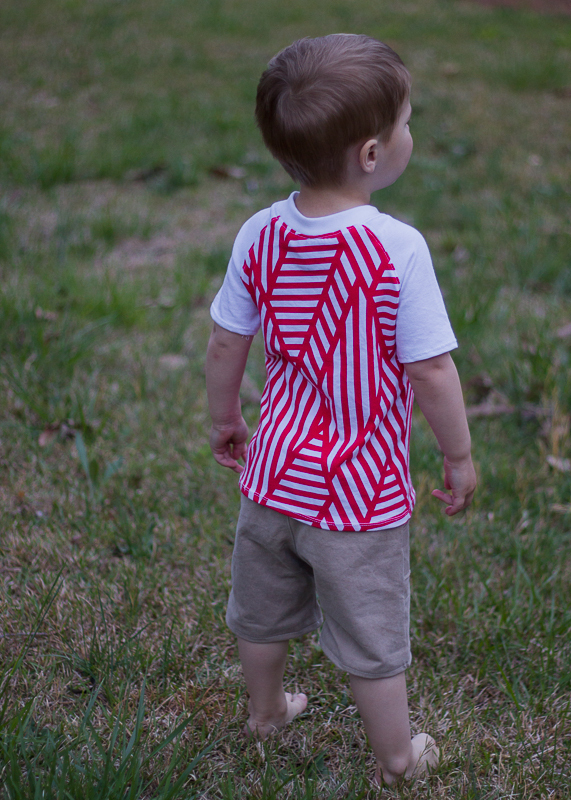 I used the raw-edged raglan pattern from Sewing for Boys for the tee but made it without the raw edges. 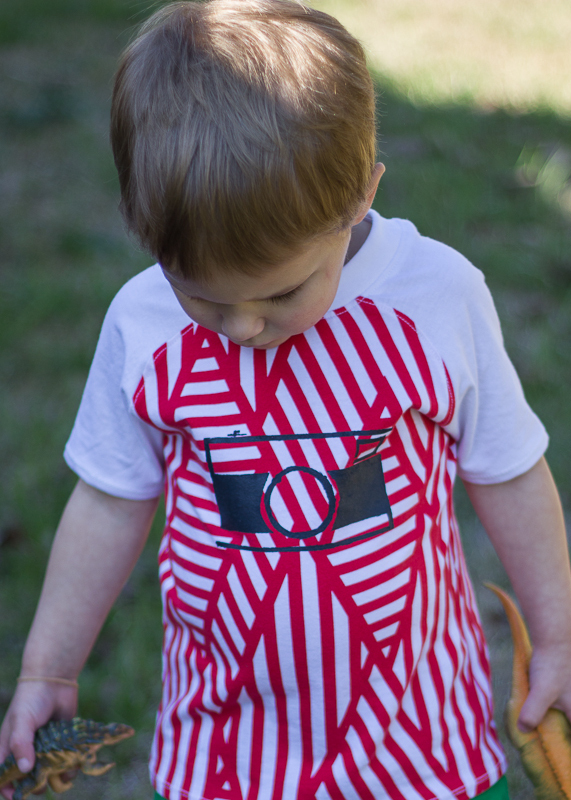 I added the white raglan sleeves to break up the abstract print a bit and then freezer paper stenciled the camera. I knew I needed to add the stencil so that my husband would be ok with the tee since he wasn’t a huge fan of the red print. I just knew it would look good though if I used it the right way! Glad my intuition was right this time. And he agreed that it looked cool once it was all finished. And that’s a wrap for kcw y’all. It was a fun week and I made a lot of cute clothes. I think O’s wardrobe is looking pretty good for this spring/summer. I am surprisingly not burned out from sewing like a mad women, but I am looking forward to not having the photo-shoots/picture editing/blog writing every evening! 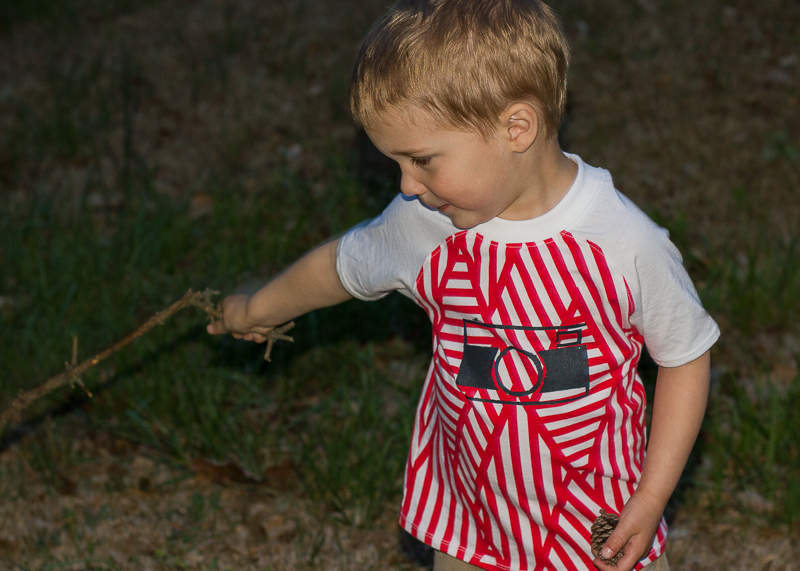 I’ll be back in a few days with my final thoughts on this kcw and a roundup of all my clothes! Hope you had an enjoyable week, and even if you didn’t get done all you wanted that you learned some things and enjoyed the kids clothes sewing community! Make sure you check out the community website and browse all the fun clothes made this week! 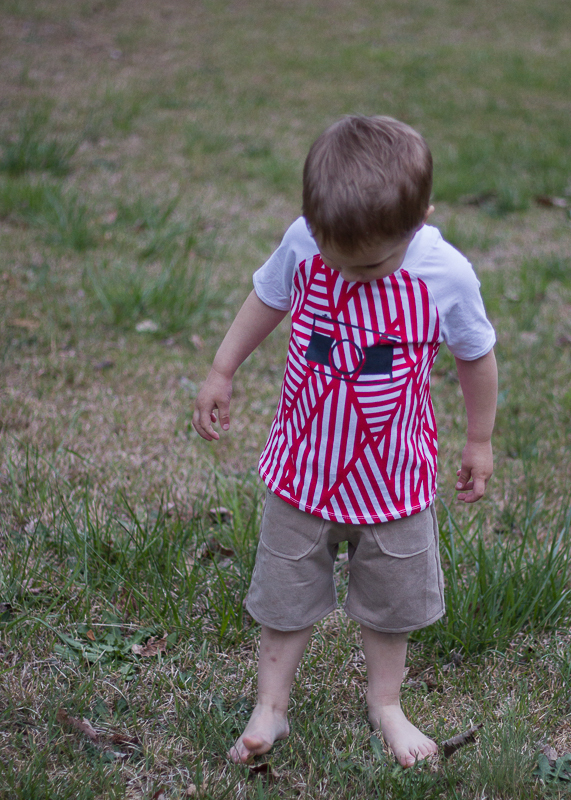 This entry was posted in Kid sewing and tagged freezer paper stencil, kid shorts made, kids clothes week, raw edged raglan tshirt by oliver's fancy. Bookmark the permalink. Great job to keep soldiering on with your finger injury! How many items did you make in total – must have been A LOT!! Time for a lie down?? Um I haven’t done my final count but I think it was 5 pairs of shorts and 7 shirts. And yeah, I pretty much crashed today! I put the kids down for their afternoon naps, sat on the couch and couldn’t move until they woke up! I think my adrenaline finally wore off. And thankfully my finger injury doesn’t seem to be too bad and is already healing up quite well! Wow- you made so much this week! And even got it posted! I think the basic shorts are great. Sometimes I get distracted by adding interesting trim and then my basics suddenly don’t match with very many things anymore! Thanks! I had a lot of fun coming up with t-shirt ideas. They get a bit addicting!